Photograph courtesy Tony Sayer 25305 at Reddish on March 5th 1983. The seventeen year year active career of D7655/25305 included allocations to only London Midland Region depots. Built: Beyer Peacock Gorton Ltd, Works No.8065. March 1967 to Birmingham Division (D02). February 1971 to London Division (D01). July 1971 to Birmingham Division (D02). April 12th 1981 to unserviceable store. June 14th 1981 withdrawn whilst at Swindon Works. August 29th 1982 reinstated to Bescot. Renumbered into TOPS March 30th 1974. 25305 was the 187th Class 25 withdrawn, one of two retired during July 1983. D7655/25305 was withdrawn twice. It was initially placed into unserviceable store on April 12th 1981 and moved to Swindon Works on May 5th 1981, and officially withdrawn on June 14th 1981 whilst still at Swindon. It was reinstated on August 29th 1982 to Bescot, departing Swindon Works on September 17th 1982, reaching Bescot five days later. After a further ten months in service 25305 was withdrawn again on July 31st 1983, but had been selected to become one of the ETHEL non-powered units, having reached Aberdeen about July 26th 1983 for conversion. 25305 would be transferred to Departmental stock & become 97251 ETHEL 2 and allocated to Eastfield during August 1983. Noted Derby Works December 1977 (accident damage). Noted Derby Works February 1983 (N6 repairs). For the 1967 summer timetable Type 2’s again were diagrammed for the seasonal weekend extras. A Toton Type 2 worked the Saturday’s only 08.00 Leicester - Clacton throughout, including D7655 on the last Saturday in July. On August 7th 7655 & 7618 were noted working the 14.30 Yarmouth - Walsall between Yarmouth & Norwich, presumably these locomotives were involved in the other parts of this summer dated diagram. On July 13th 25305 & 25185 worked the 08.00 Walsall - Yarmouth to Norwich, returning from there with the 14.15 Yarmouth - Derby. Green liveried 47365 encountered trouble on July 26th working the 09.23 Manchester – Plymouth, becoming a partial failure at Exeter. 25305 was added to the train for assistance going west over the Devon banks. 25200 & 25305 were noted at Newcastle with the Coatbridge - Nottingham on September 9th, 40133 took the train south. 25305 was noted at Rugby with a permanent way train on March 13th. The relief 09.56 Rhyl - Crewe and and the relief 12.10 Crewe - Rhyl on June 5th were hauled by 25305. The middle of July 1977 produced a busy week for 25305 & 25151. On July 9th they worked a relief Hinckley - Yarmouth to Norwich, this was followed by three roundtrips to Skegness; on July 10th from Leicester, on July 11th from Nottingham, on July 13th 25305 & 25151 worked out from Nottingham but returned to Leicester. On August 1st 1977 a roundtrip Loughborough - Skegness day excursion was worked by 25305 & 25262. On May 28th the 08.45 Birmingham New Street - Barmouth and the return 17.45 Barmouth - Euston to Wolverhampton was worked by 25305 & 25307. At lunchtime on August 8th 25305 was noted at Washwood Heath Yard on car flats. The 11.33 Rugby - Euston electric multiple unit was assisted between Northampton & Bletchley on July 22nd by 25305 due to the power being off for engineering works. On August 11th 25305 & 25208 worked the 04.15 Shrewsbury - Aberystwyth and the 10.09 Aberystwyth - Euston to Wolverhampton. The next day (12th) the same pair worked the 08.45 Birmingham New Street - Barmouth and the 17.45 Barmouth - Euston to Wolverhampton. A week later on August 18th the 10.10 Euston - Aberystwyth from Birmingham New Street and the 16.10 Aberystwyth - Shrewsbury were worked by 25305 & 25325. When an afternoon Manchester – Paddington service failed at Coventry on October 13th the nearest help was 25248 & 25305 which worked all the way to Paddington and returned north on the 19.00 Paddington – Manchester! On December 13th the 10.18 Birmingham - Euston failed north of Berkswell behind 86243. 25305 was sent light engine from Coventry and dragged the failure to Coventry where the service was terminated. The 12.22 Bedworth – Lindsey oil tanks of August 22nd ran behind 25305. The 10.10 Euston - Aberystwyth from Birmingham New Street and the 16.10 Aberystwyth - Shrewsbury were worked by 25305 & 25242 on May 24th and by 25305 & 25277 on May 31st. 25305 & 25242 were back together on June 7th to work the 08.02 Walsall - Yarmouth to Norwich, returning from there with the 14.15 Yarmouth - Derby. The 'Severn Valley Invader' railtour on June 28th from Newcastle to Bewdley was worked between Birmingham New Street & Bewdley out & back by 25305 & 25308. The 09.40 Manchester Victoria - Llandudno Town was worked by 25305 on August 26th. On February 24th the 13.10 Euston - Birmingham New Street was assisted between Nuneaton & Birmingham New Street by 25305. 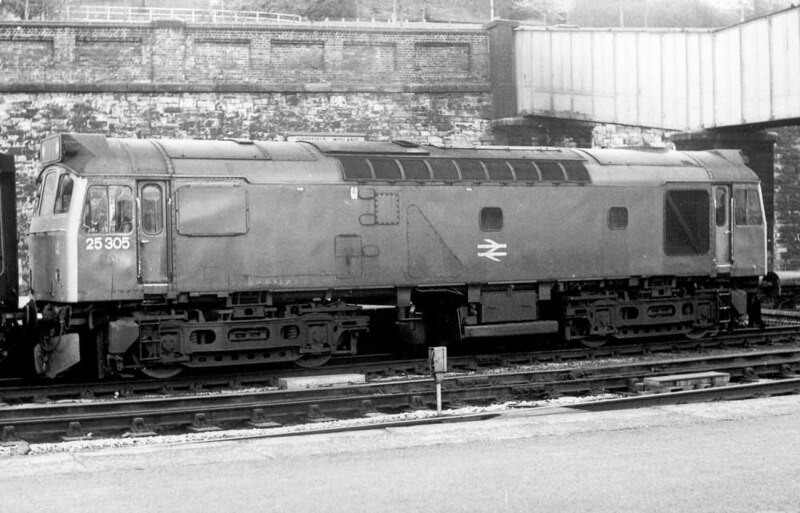 Photograph collection of webmaster 25305 at Sheffield, date unknown. At Swindon Works interest had been shown by London Transport in possibly acquiring three Class 25 locomotives, however nothing concrete materialised from this idea, although possibly 25246 & 25305 were set aside in the North Yard following from this enquiry. Following the recent examples (25184, 25262, 25308) of unserviceable Class 25’s being returned to service it was perhaps no surprise that Swindon should re-activate 25305 late in July. It had been out of traffic for sixteen months, parts were taken from 25246 to make 25305 roadworthy. This reinstatement left all the remaining Class 25’s at Swindon Works in the ‘condemned for scrapping’ category. A diesel multiple unit failure on September 21st saw 25305 assist the 16.40 Gloucester - Cheltenham Spa. On June 4th the 10.10 Euston - Aberystwyth from Birmingham New Street and the 17.15 Aberystwyth - Crewe were worked by 25305 & 25194. The next day (5th) the same pair worked a roundtrip Birmingham New Street - Rhyl day excursion. On June 23rd Crewe depot sent withdrawn 25314/319 to Derby Works. They had been out of service for about three months and were received at Derby for generator and bogie work prior to their moving to Aberdeen to join ADB 97250 as generator vehicles. 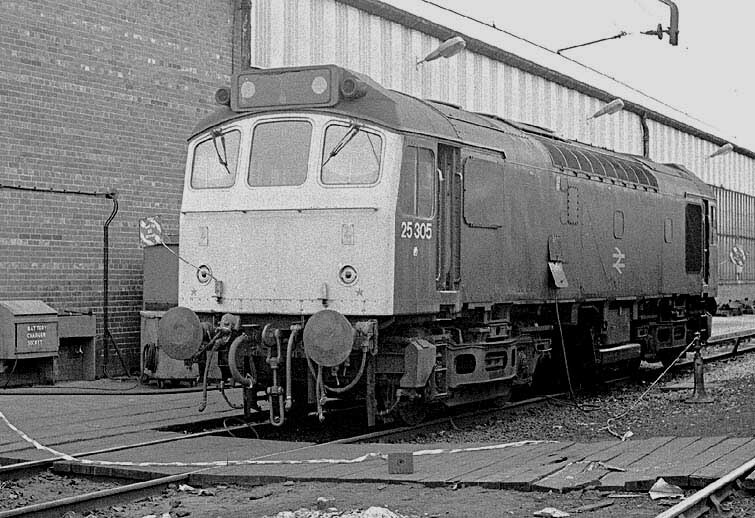 25314 would become ADB 97252 but 25319 would not leave Derby as intended, eventually being scrapped at Swindon in December 1985. It would be replaced by 25305, as ADB 97251, which had been withdrawn, for its second time, from Bescot in July 1983. The final passenger working for 25305 took place with 25316 on July 2nd working the 10.10 Euston - Shrewsbury from Birmingham New Street. 25305 was withdrawn again on July 31st 1983, but had been selected to become one of the ETHEL non-powered units, having reached Aberdeen about July 26th 1983 for conversion. 25305 would be transferred to Departmental stock & become 97251 ETHEL 2 and allocated to Eastfield during August 1983. Page added September 21st 2013.